Every fall, we have the blessing of celebrating Guru Ram Das Ji’s birthday. 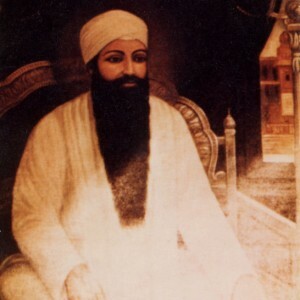 Guru Ram Das was the fourth Sikh Guru, and was known for his humility, service and deep devotion. He founded the city of Amritsar and designed the Golden Temple. There are 688 shabads of Guru Ram Das included in the Siri Guru Granth Sahib and he wrote the Lavan (the Sikh marriage vows), as well as parts of Rehiras and Kirtan Sohila. Guru Ram Das held a special place in the heart of the Siri Singh Sahib, and our local community looks to Guru Ram Das for guidance, for healing, and for protection. Many of our ashrams & Gurdwaras were named in his honor. 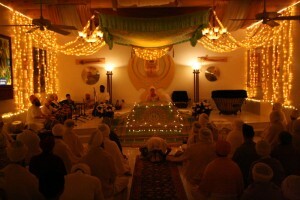 The Siri Singh Sahib started a beautiful special sadhana to do in celebration of Guru Ram Das’s birthday. For 11 days prior to his Guru Ram Das Ji’s birthday we chant the shabad ‘Dhan Dhan Ram Das Guru‘ for 31 minutes. This is the Shabad of Miracles. In many communities, Gurdwaras, ashram members, students and friends gather together to chant this shabad with devotion and faith, during the 11 days leading up to his birthday. Then, on October 9th, the day of Guru Ram Das Ji’s birth, we have a special sadhana of chanting the shabad ‘Dhan Dhan Ram Das Guru‘ for 2 ½ hours in the Amrit Vela.What a special time. Celebrations will be almost all day Sunday October 9th. Below is the schedule and details…. Date and times listed in Mountain Standard Time (GMT -7:00) – New Mexico – USA. You can google "what time is it in New Mexico" to see the current time here. I love this time of year during the fall when it is so beautiful. Then on top of it having these beautiful cozy evenings of Kirtan. It’s great being in the Gurdwara, but there is something unique and special about many members of the community opening their homes for all to come and sing and chant together in praise of Guru Ram Das. Every evening we go to someone else’s home, sing, meditate and then be served food by the hosts. Even if you do not have a Gurdwara or community you can play kirtan in your home or take the time to meditate on Gurbani. You can listen to the Shabad in praise of Guru Ram Das below along with many other musicians. You can also hear many more audios and hukams by Guru Ram Das in the Gurbani Media Center. For the next week or so you can tune into Channel 1 of SikhNet Radio to listen to a selection of Kirtan by Guru Ram Das (or in praise of him). In the "old days" (1970's) in the Sadh Sangat around Preuss Road in Los Angeles we would have a procession on Guru Ram Das Birthday. We would start at a home or ashram and sing to Guru Ram Das and be served i.e. soup, then we would continue down the street to the next home for more chanting and the next course, perhaps salad, then the next home a casserole. Our final destination was the Gurdwara at Guru Ram Das Ashram where we celebrated with a full Gurdwara. A candle Light procession and families walking and singing together. What a beautiful tradition!